A convenient and low-cost diagnostic tool to help the user check flow and pressure simultaneously. 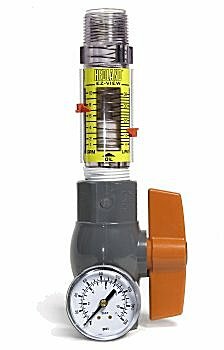 Can be used as a trouble shooting tool to help: check pump leakage under load, verify correct flow, pressure or control settings. Helps to find line restrictions, verify pressure drops and balance multi-line systems. Radel is a registered trademark of Union Carbide Corporation.